Science: Unintended Consequences: Ancel Keys, Cholesterol, and the Transition to an Obese Society; Part II, The Something Else Hypothesis. The findings in the 1950s and 1960s that high blood cholesterol was associated with CHD and that dietary cholesterol and saturated fat could influence blood cholesterol initiated a 4 to 5 decade war on the intake of fat as a causative factor of cardiovascular disease. The only problem with this approach was the fact that the real story was much more complicated than any investigator could imagine or studies at the time could show. There is one additional factor that needs to be discussed here that is almost never taken into account in a review of the development of the “fat as evil” story. And this factor may have inserted a major confounding effect into the entire story of fat as the cause of cardiovascular disease story. In the 1940s American food companies supported the introduction of a relatively new product onto the foodscape. This product was the result of efforts to find a way to sell excess vegetable oils. The product was called margarine. The product was advertized to be healthy compared to the “evil” butter, and it was cheaper, too. There was only one major problem with margarine, unknown at the time, which was that during the process of hardening of liquid vegetable oil into solid bars, toxic fatty acids, called trans fatty acids, were formed during the hydrogenation process. On the slide below the per capita consumption of margarine is shown for the US. 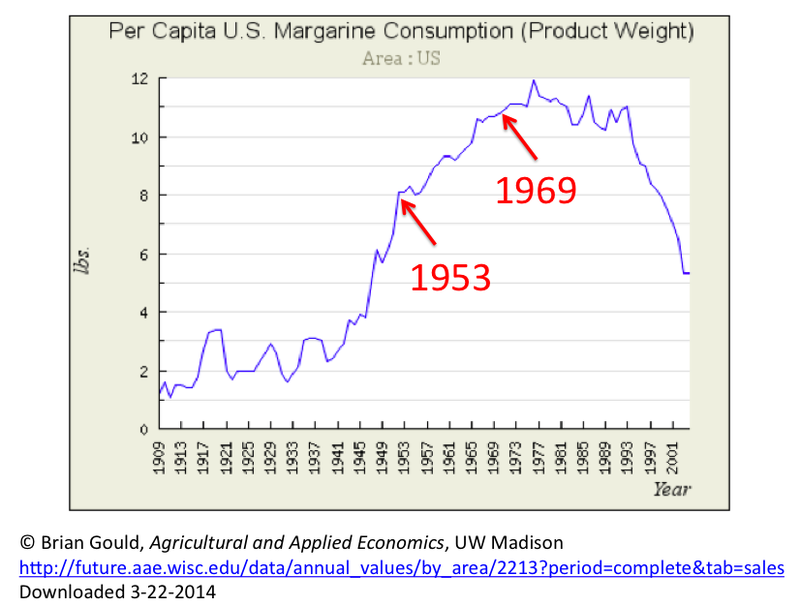 Note that the half maximal intake of margarine occurred in the US about 1953, and that consumption leveled off about 1969 and lasted as a long plateau until 1990. So maybe fat intake, in part, was responsible for increased cardiovascular disease during this time. However, much of this effect may have been due to the introduction of margarine as a major food product. The figure below shows the composition of margarine versus butter and tub (soft) margarine. Whereas butter is 51% saturated and contains 3% trans fatty acids, margarine contains 21% saturated and 24% trans fatty acids. 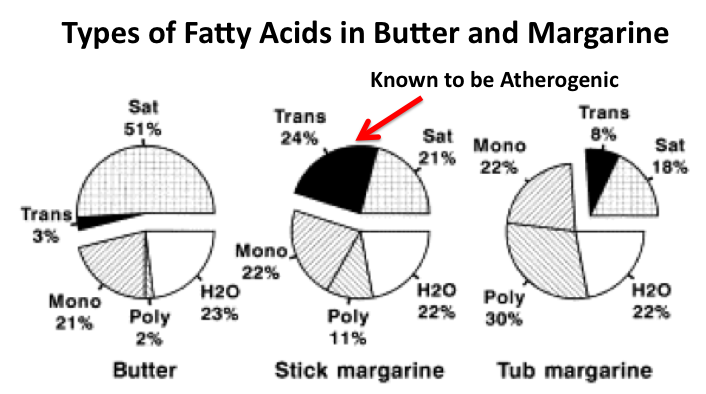 The 24 % trans is considered much more dangerous than the saturated fatty acids found in butter. Studies have shown that trans fatty acid raise LDL cholesterol and lower HDL cholesterol, changes that would greatly increase the risk for CHD. The composition of stick margarine was undoubtedly more atherogenic than the composition of butter. Therefore, increasing consumption of margarine would probably camouflage much of the improvements in CHD risk accomplished by lowering total intake of fat and cholesterol in the American diet. Figure: Composition, in grams per 100 grams of product, of butter and of the average stick margarines (N=32) and tub margarines (N=17) used in the 20 experiments reviewed. Sat, saturated fatty acids; Trans, trans fatty acids; Mono,cist-monounsaturated fatty acids; Poly, polyunsaturated fatty acids; and H20, water plus glycerol and other minor substances. Butter contains about 220 mg, vegetable margarines less than 1 mg, and margarines made with animal fats 70–275 mg cholesterol per 100 grams of product. (Zock PL, Katan MB., Butter, margarine and serum lipoproteins. Atherosclerosis. 1997 May;131(1):7-16). In Ancel Keys’ seven countries study, the country that had the highest incidence of CHD was eastern Finland. The population of eastern Finland was known to have a very high intake of fat, including a very high use of butter in every day meals. Therefore, if high intakes of saturated fat and cholesterol intake were responsible for the high rates of CHD, then efforts to decrease their intake in eastern Finland would have the best chance to show the efficacy of lowering serum cholesterol. 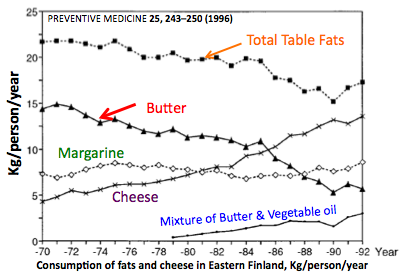 Through most of this period, margarine intake was fairly low and constant, and therefore, if the people of Finland decreased their serum cholesterol concentrations through diet, especially those with very high cholesterol levels, the full beneficial effects of lipid lowering on CHD should have been observed directly. This is exactly happened. Health officials instituted programs to educate the population on the effects of eating high levels of fat, and their intake did indeed fall. 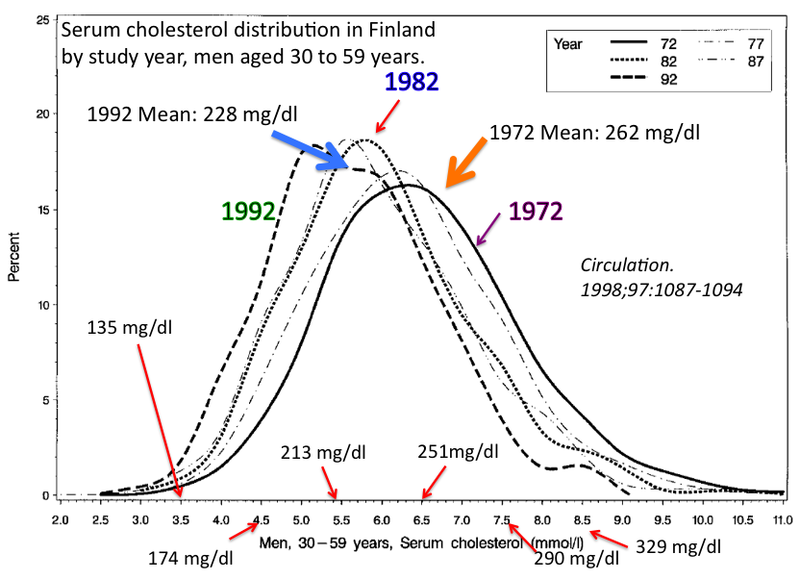 Below is a figure that shows serum cholesterol distribution in men, aged 30 to 59 years, in Finland by study year. From 1972 to 1992, the distribution of cholesterol shifted left, such that the mean cholesterol in men decreased from 262 mg/dl to 228 mg/dl. In a 25 year period from about 1970 to 1995, mortality from CHD in eastern Finland decreased to about less than half of that previously observed, with decreased cholesterol concentrations responsible for about half the decrease in CHD (the other half being due to lower smoking and decreased blood pressure). The figure below shows the decrease intake of table fats in Finland. During the course of the study the intake of total table fats, and butter in particular, decreased. The consumption of margarine stayed consistent. Interestingly, the consumption of cheese, not considered a table fat, increased during the study. In Finland, the serum cholesterol concentrations decreased steadily from about 1970 onward, and the incidence of CHD also decreased during the period. In the US, the rate of deaths from CHD declined much slower, as did the serum cholesterol concentrations. One factor that may have been responsible was the large increase in the consumption of stick margarine, starting in the 1950s in the US. However, there is really no way of knowing how detrimental the increased consumption of margarine was for the American public. One thing is for sure, Dr. Ancel Keys had no idea that, exactly when his study was being conducted, the intake of a dangerous fat (trans fat) was steadily increasing. This is the perfect example of the “Something Else Hypothesis,” which posits that, in certain instances, something totally different, essentially an unknown unknown, may be the actual cause of the results being observed in a research study, and not the reasons the researchers have carefully extracted from analysis of the basic data. There was no way that Ancel Keys could have known that his entire study, at least the American portion of it, was being undermined by the introduction of margarine into the US diet. « Science: Unintended Consequences: Ancel Keys, Cholesterol, and the Transition to an Obese Society; Part I, The Man Who Started It All.